NoBu (North Burnet Road) is Austin’s answer to South Austin’s SoLa (South Lamar) and SoCo (South Congress). When I first moved to Hyde Park Austin in 2003, I used to joke that everything I needed was located around the intersection of Burnet and 183. In the last decade, NoBu has certainly grown in leaps and bounds. The area south of 183 has got you covered for food and margaritas – it has always had cafés like Pacha and perennial favorites like Waterloo Ice House and Trudy’s. It has Sherlock’s Baker St. Pub and Grill (no relation) if you want formulaic English themed sports bars, but it also has dive bars like Buddy’s Place – the only bar I can recall visiting that has a mannequin to talk to. If you want to dive off a little West on Anderson Road, you can access The Alamo Village and surrounding bars like Cover 3. You can play poker and two step at Dallas Nightclub, drink at the Pour House and learn to Box at Bruce’s KO Gym. Grease lovers will enjoy Top Notch Hamburgers and people getting ready for Tough Mudder might practice a little at Hot Lava Obstacle Course. Developers have cottoned onto the popularity of the former cotton fields that was Brentwood until the 1940s, and Midtown Commons is a mixed use development on CapMetro’s commuter rail just East of NoBu. This means easy access to Downtown Austin. And Leander, if you really want to go out of town! 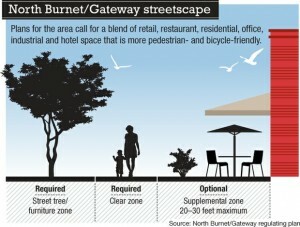 North Burnet / Gateway is a 2300 acre area of special attention for responsible urban growth which adopted a neighborhood plan in 2006 – this part of Burnet Road is all North of 183. I’m not saying that NoBu is for everyone, but it certainly has a bunch of original places to eat, drink, and be entertained, all without having to get on a highway – it’s easy access from the Austin neighborhoods like Crestview, Brentwood, Allendale and Brykerwoods. Sure, 78756 and 78757 and 78758 might not have the marketing budget of zip codes like 78704, but for me that’s a good thing – it means that there is still a variety of relatively affordable Austin real estate within a short bus ride, bike ride or drive of the University of Texas Campus – from single family homes to condos. Give us a call if you’d like to learn more about the NoBu neighborhood at 512 215 4785 or get in touch with a NoBu real estate specialist.